The magazine issue’s relevance extends far beyond intentional communities, which serve as microcosms for dealing with these core social concerns. 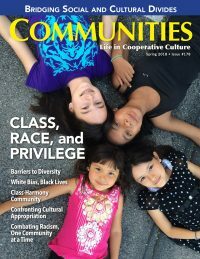 In order to facilitate wider distribution and readership of this issue, the FIC is offering digital copies of issue #178 for free download from https://www.ic.org/community-bookstore/product/communities-magazine-178-spring-2018-class-race-privilege —including formats compatible with every variation of electronic device. The FIC is soliciting donations to support this offering, but not as a condition of digital issue download. To learn more about the Fellowship for Intentional Community visit www.ic.org or www.facebook.com/FellowshipForIntentionalCommunity. The FIC is funded by members, donors, and subscribers, and it also offers the public an online community bookstore with hundreds of low-cost and free resources, and a directory for searching for and locating intentional communities across the globe.